You should never need an excuse to enjoy a delicious frozen drink on a hot summer day. For us at Margaritaville, it’s pretty much mandatory. But if you were searching for the perfect excuse (for some reason), look no further – July 19th (today!) 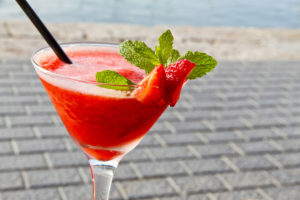 is National Daiquiri Day! Celebrate this very important holiday with one of these fantastic variations on the classic rum cocktail. Cheers all around. On a day devoted to honoring one of the classic cocktails that everyone should master, you can’t do much better than the original recipe. Warning: it isn’t frozen. 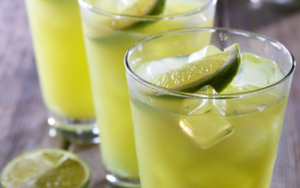 This timeless daiquiri recipe will keep you feeling cool and festive all day long. When most people think of daiquiris, their mind goes to the super-sweet, deep pink version of the drink. This strawberry daiquiri recipe uses fresh strawberries instead of frozen in honor of peak strawberry season! Must make this right now. 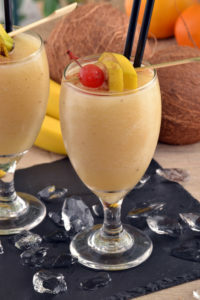 While you’re on a fruity frozen drink kick (the best kind of “kick” there is), why not try a banana daiquiri? We’re talking real bananas, popped in the freezer for a few hours and blended into your frozen cocktail – no artificial flavors here. Because boozy drinks are healthier if they have fruit in them…right? It’s basically banana ice cream… with alcohol. So much to love. Pro tip: make sure you freeze your bananas when they’re very ripe, or you won’t be able to taste that sweet banana flavor in your daiquiri. Blend with 1/2 cup to 1 cup of cracked ice until smooth. Pour into large margarita or rocks glass. Yum. If you want to feel cultured as you sip your frozen cocktail, try channeling the spirit of Ernest Hemingway through his proclaimed favorite drink. 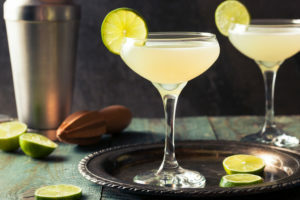 The Hemingway Daiquiri is a less-sweet riff on the original that replaces added sugars with grapefruit juice and a splash of maraschino liqueur. Fun fact: Hemingway Daiquiris are also commonly referred to as a “Papa Dobles” because Hemingway would ask bartenders to double the booze in each drink. Well done, Mr. Hemingway.